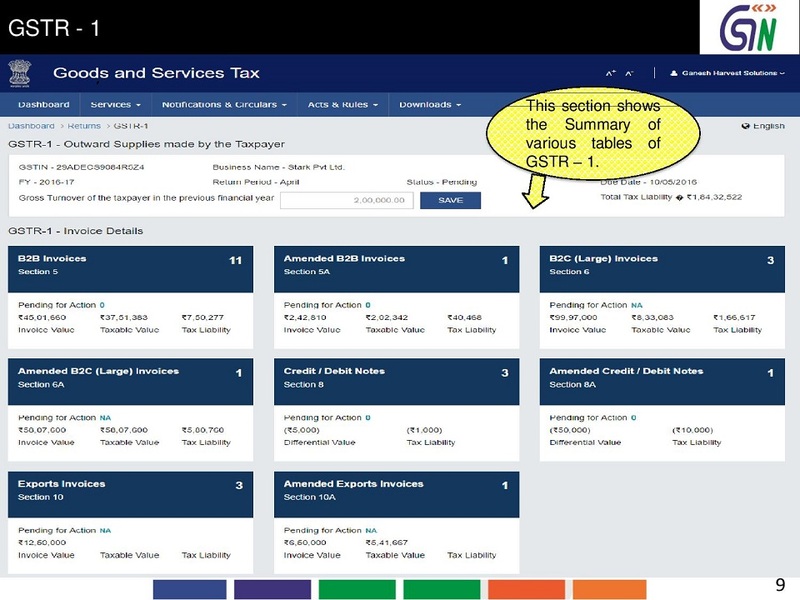 This section shows the Summary of various tables of GSTR-1. 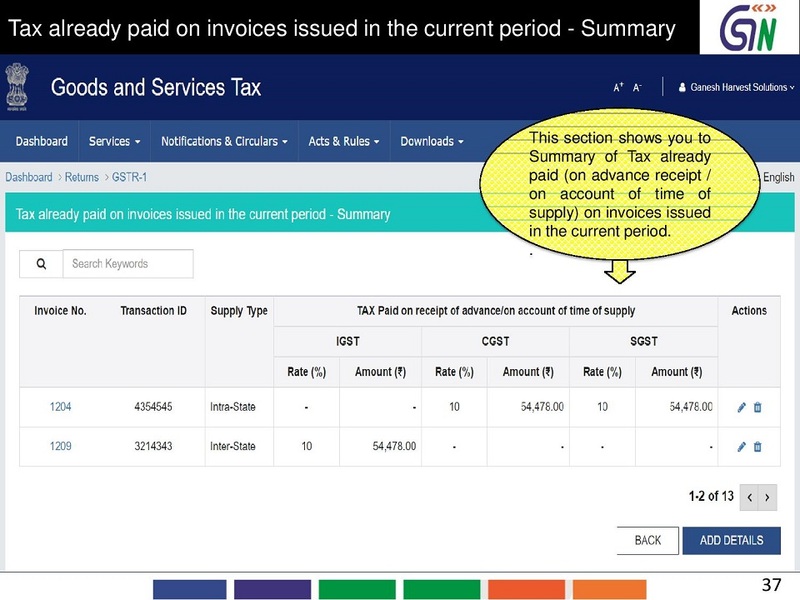 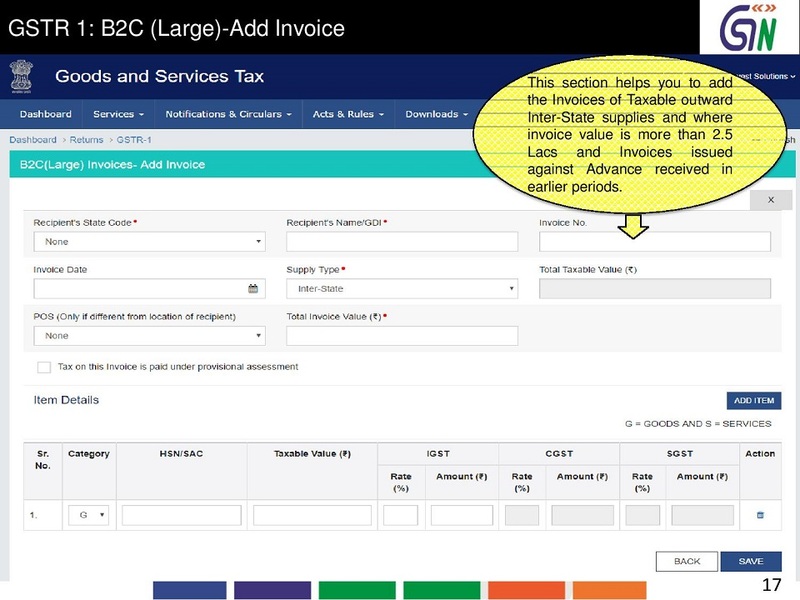 This section helps you to add the Invoices. 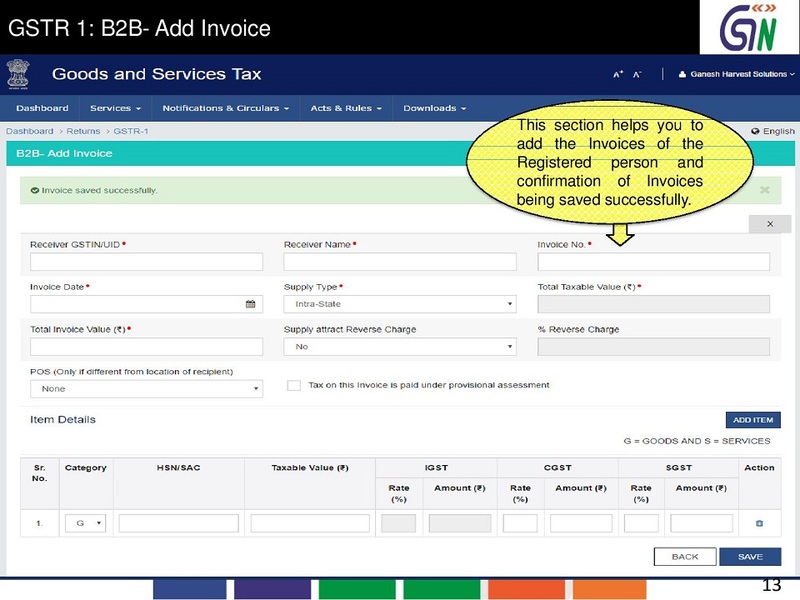 This section helps you to add the Invoicesof the Registered person and confirmation of Invoices being saved successfully. 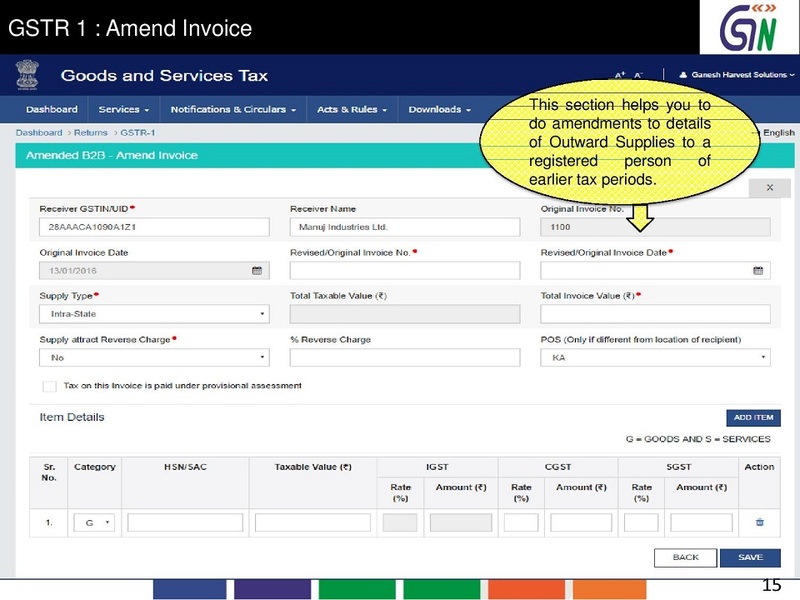 This section helps you to do amendments to details of Outward Supplies to a registered person of earlier tax periods. 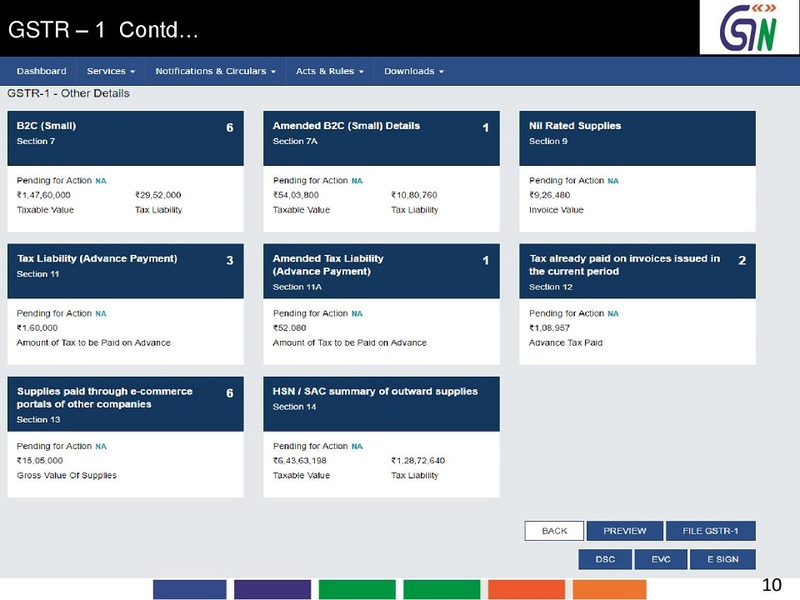 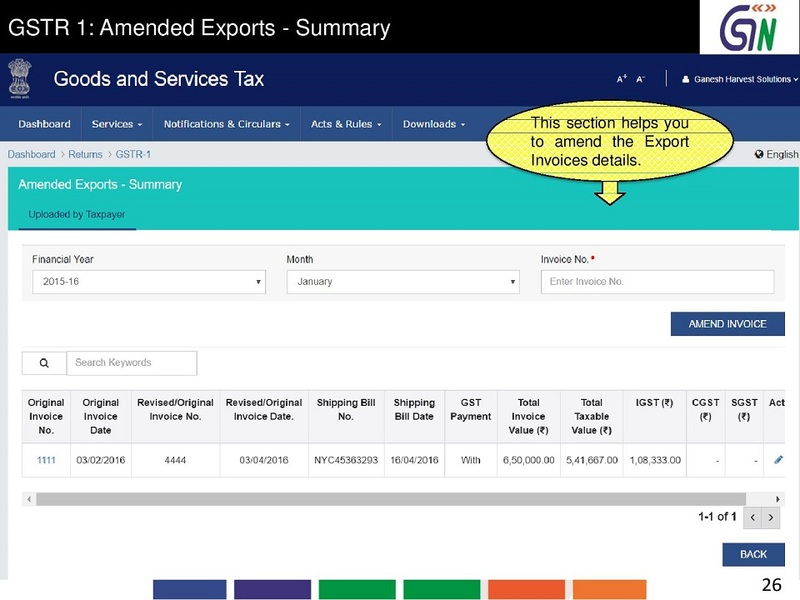 This section helps you to add the Invoices of Taxable outward Inter -State supplies and where invoice value is more than 2.5 Lacs and Invoices issued against Advance received in earlier periods. 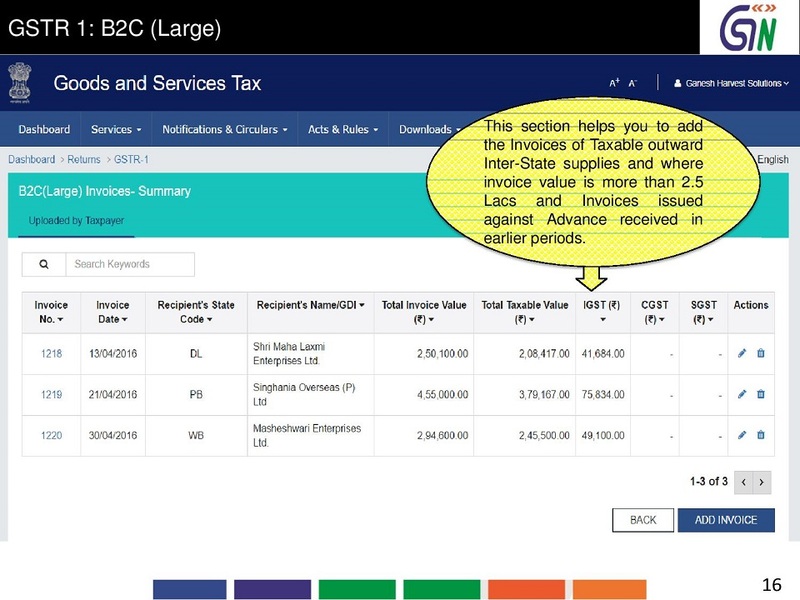 This section helps you to amend the Invoices of Taxable out ward Inter-State spplies and where invoice value is more than 2.5 Lacs and Invoice issued against Advance received in earlier periods. 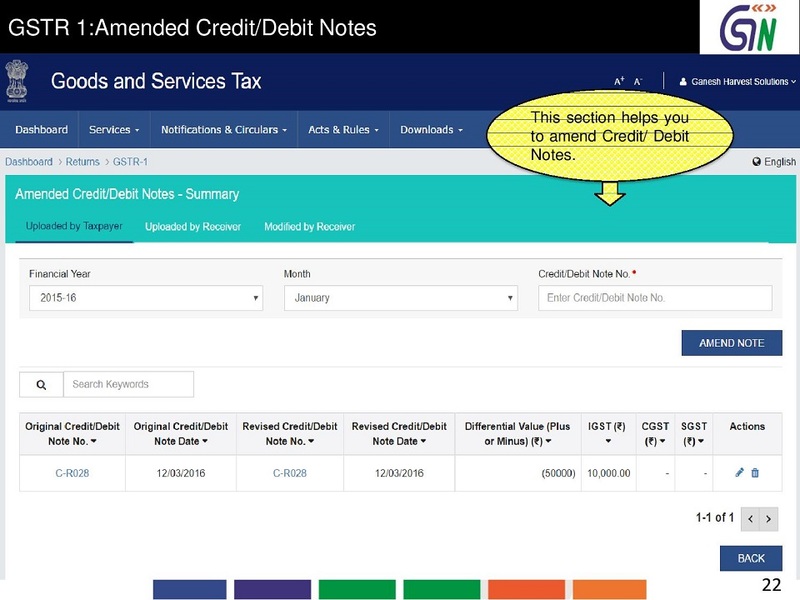 This sections hows you the summary of Credit/Debit Notes. 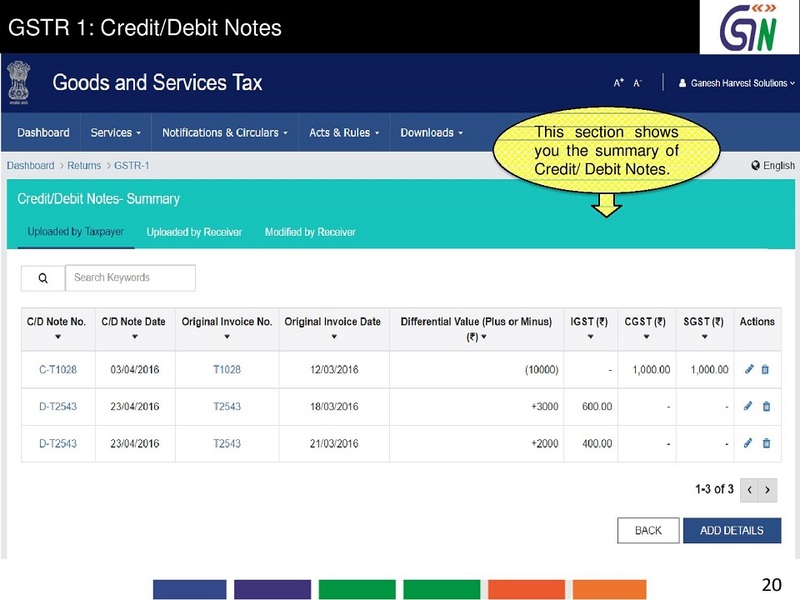 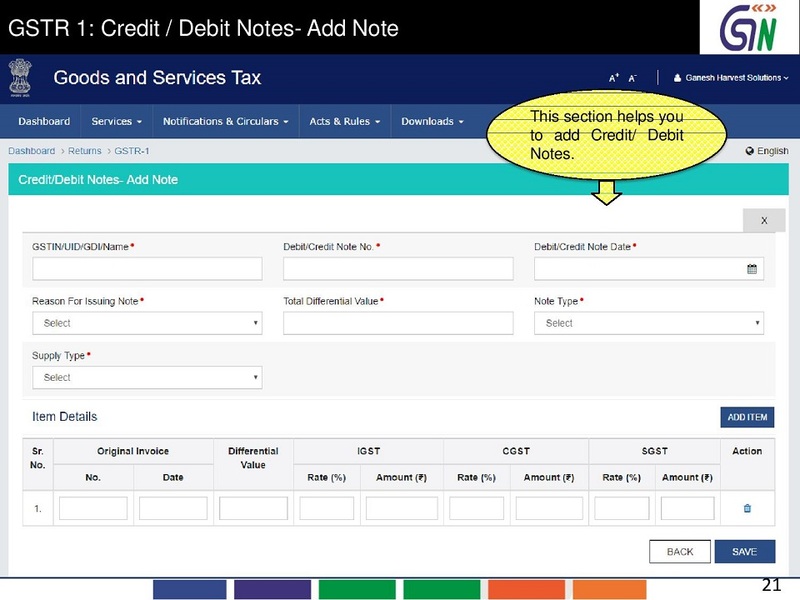 This section helps you to add Credit/Debit Notes. This section helps you to amend Credit/Debit Notes. 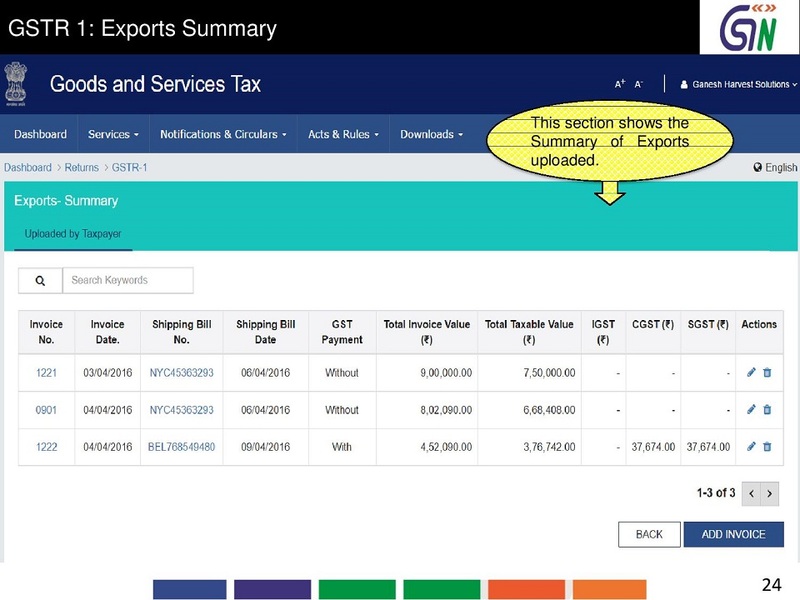 This sections hows the Summary of Exports uploaded. 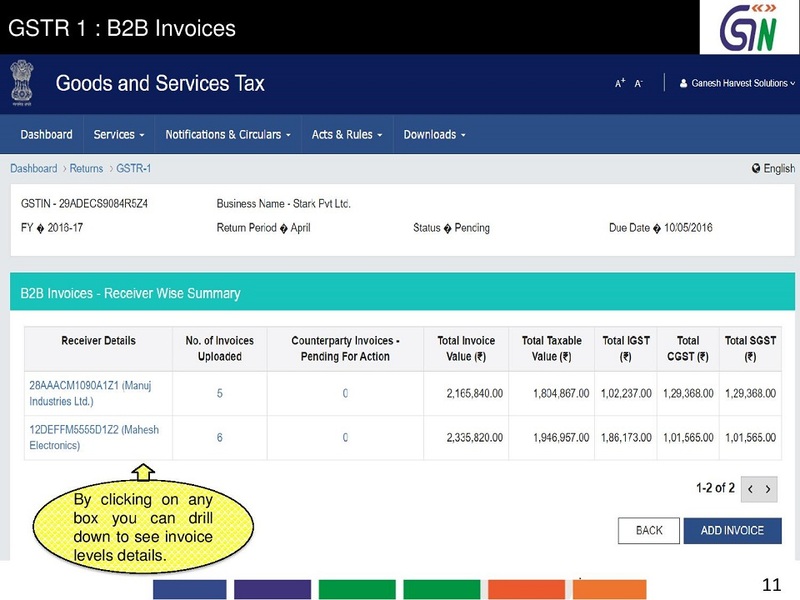 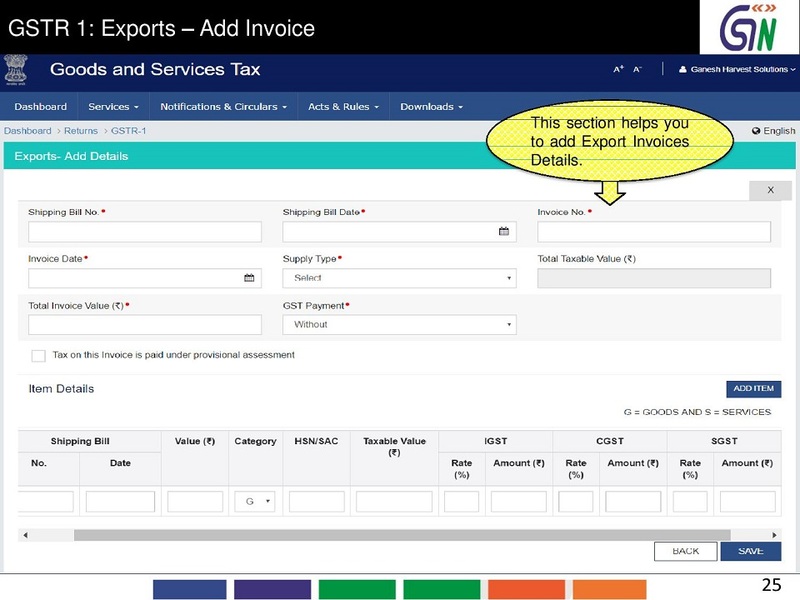 This section helps you to add Export Invoices Details. 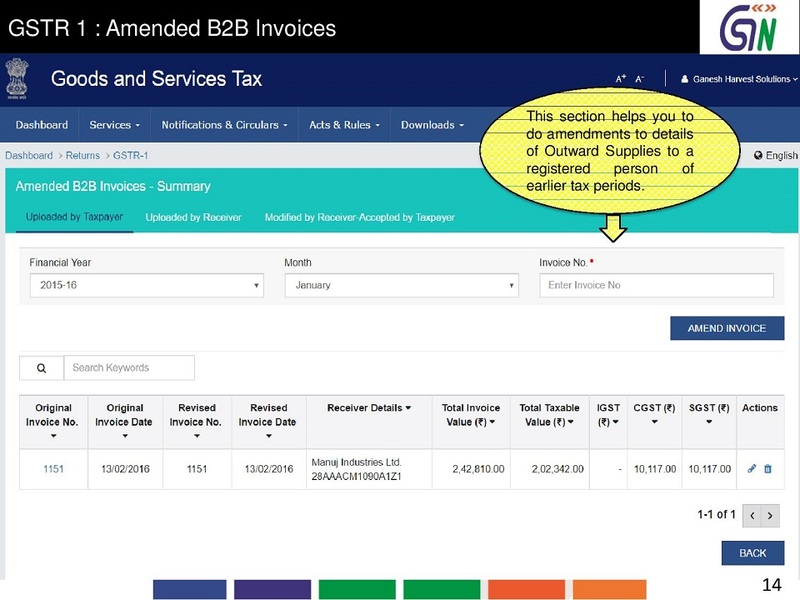 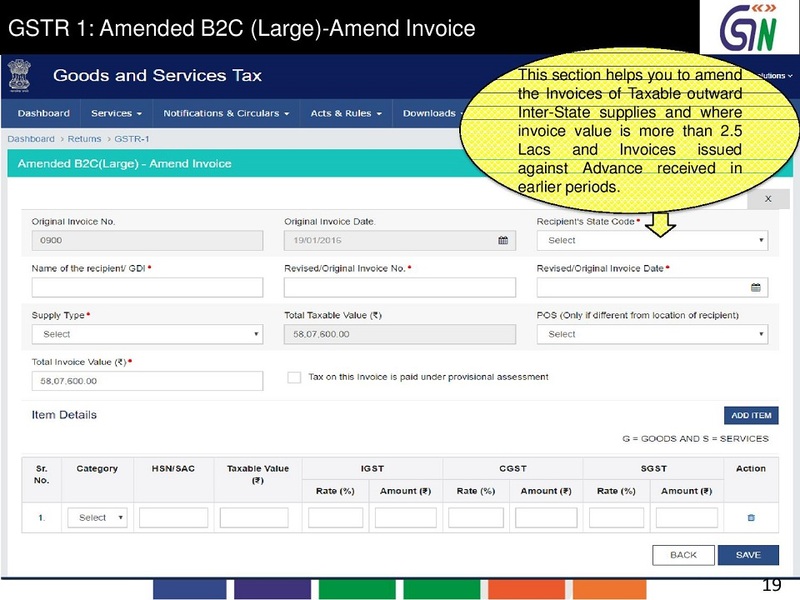 This section helps you to amend the Export Invoices details. 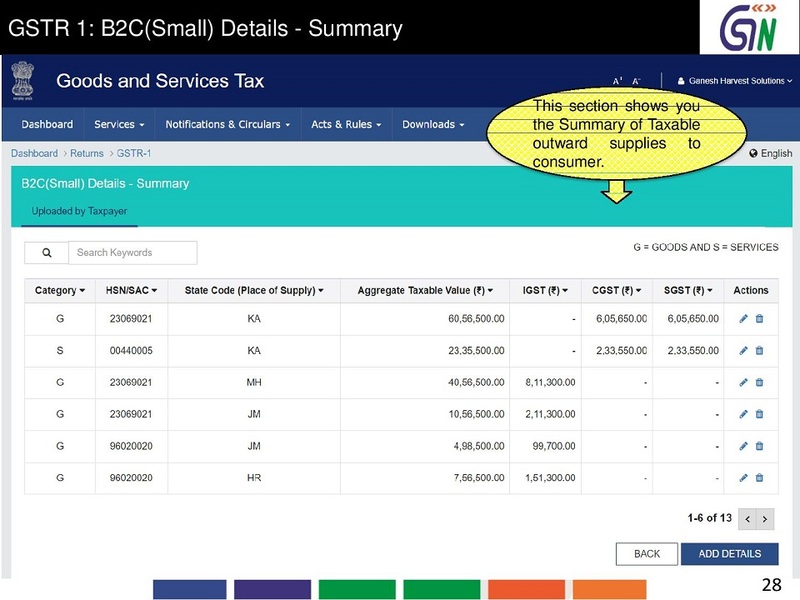 This sections hows you the Summary of Taxable outward supplies to consumer. 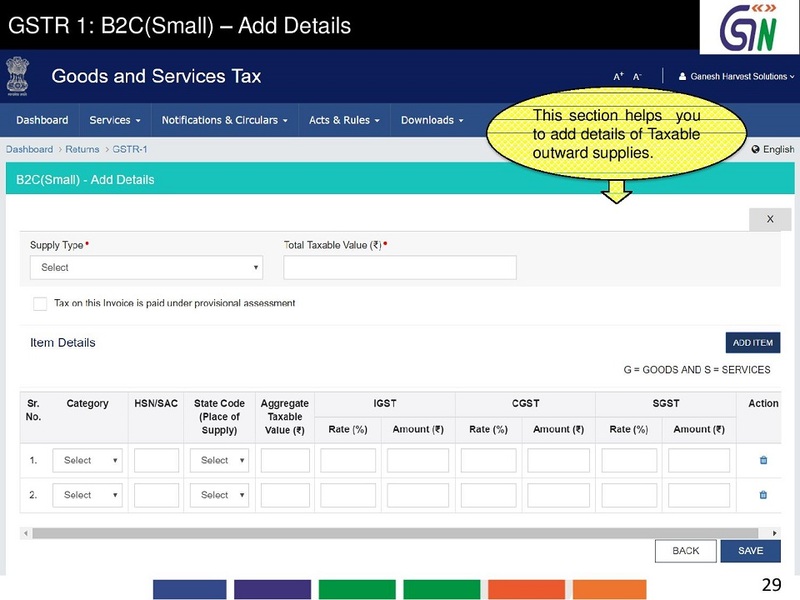 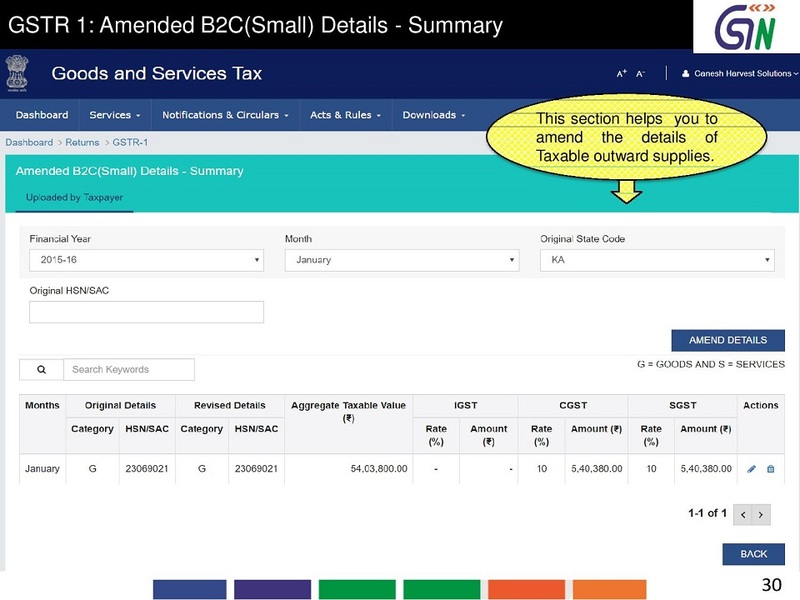 This section helps you to add details of Taxable outward supplies. 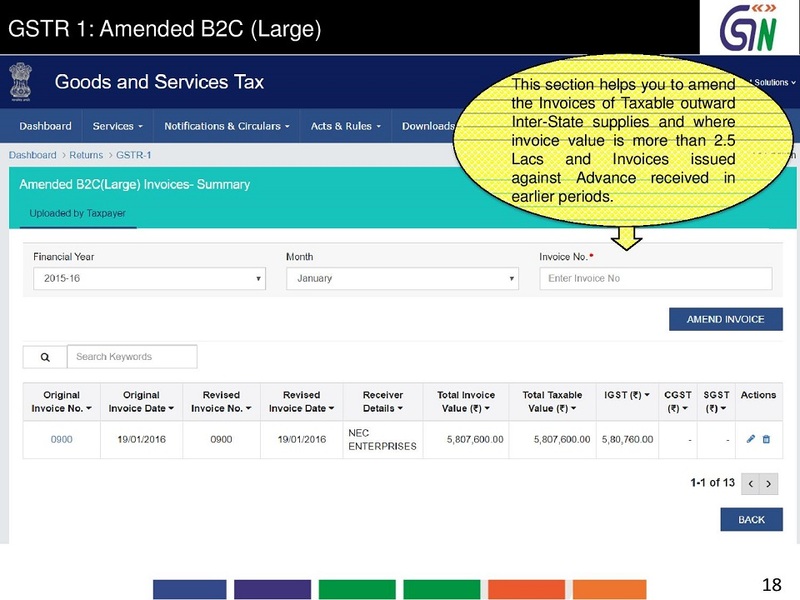 This section helps you to amend the details of Taxable outward supplies. 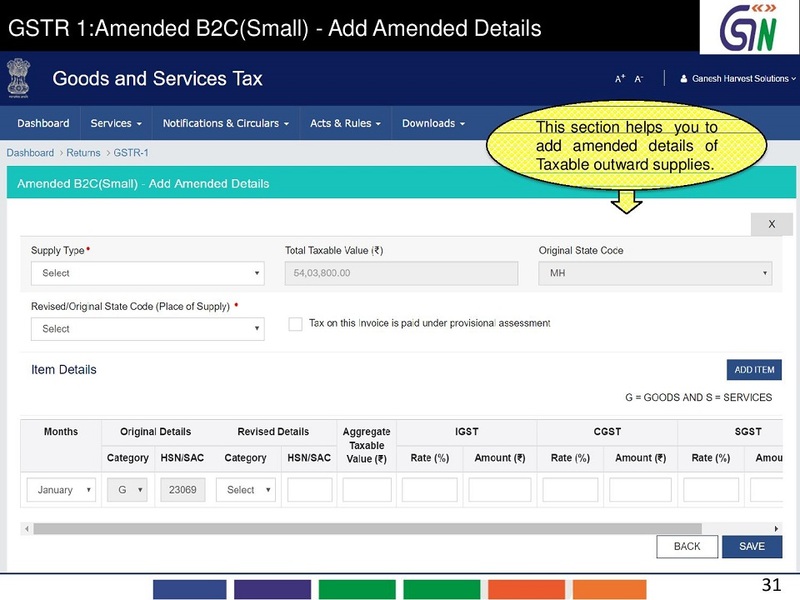 This section helps you to add amended details of Taxable outward supplies. 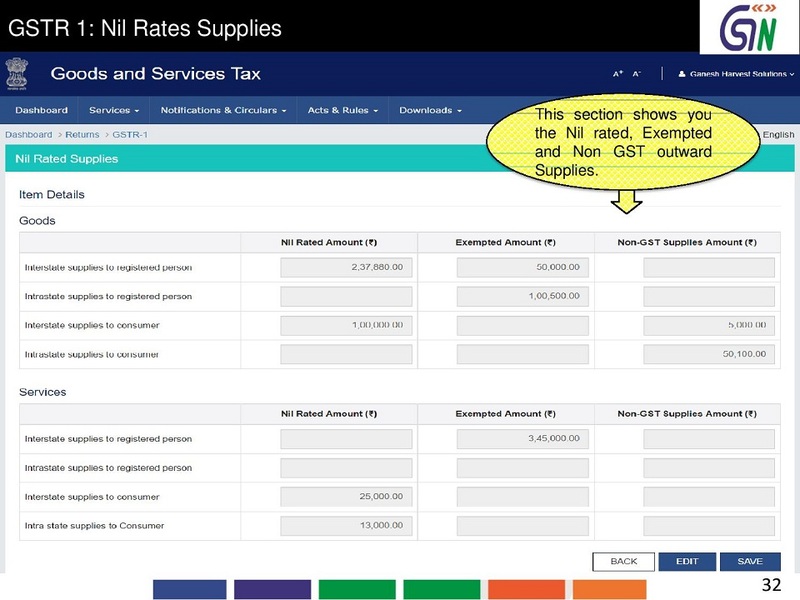 This section shows you the Nilrated ,Exempted and Non GST outward Supplies. 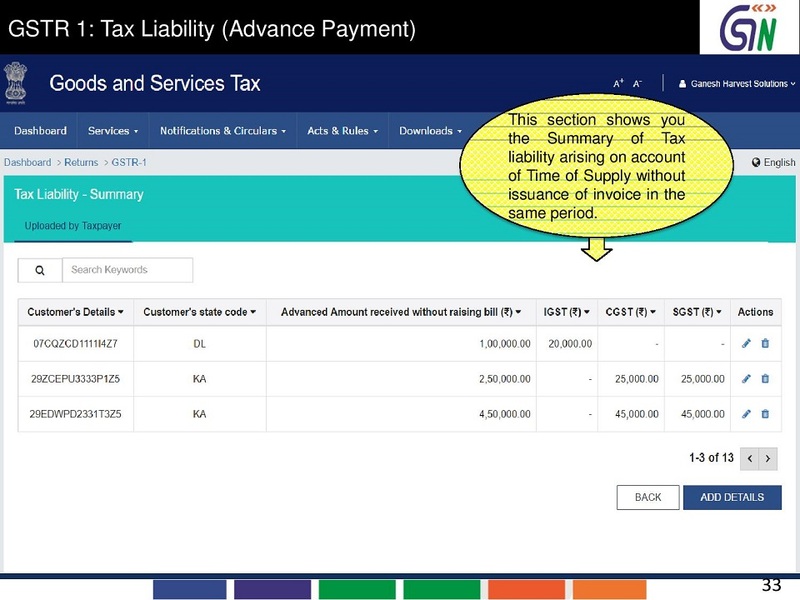 This section shows you the Summary of Tax liability arising on account of Time of Supply without issuance of invoice in the same period. 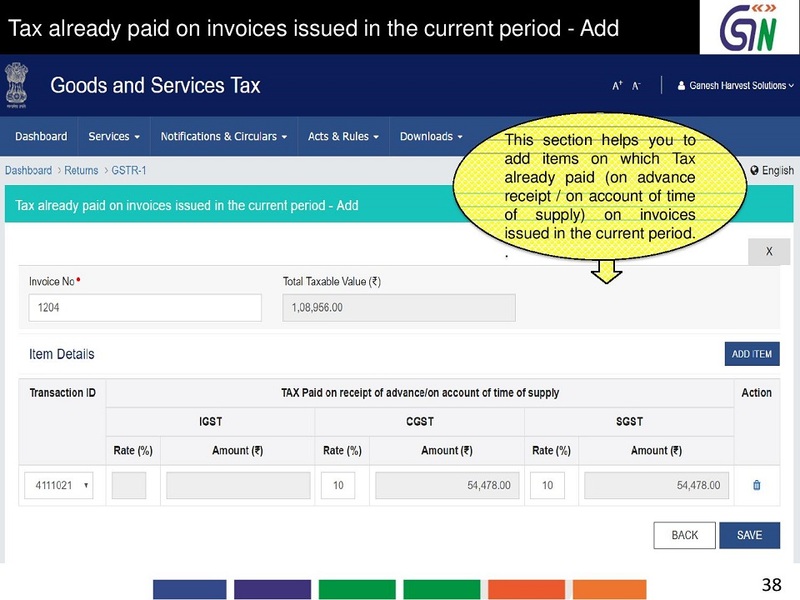 This section helps you to add details of Taxliability arising on account of Time of Supply without issuance of invoice in the same period. 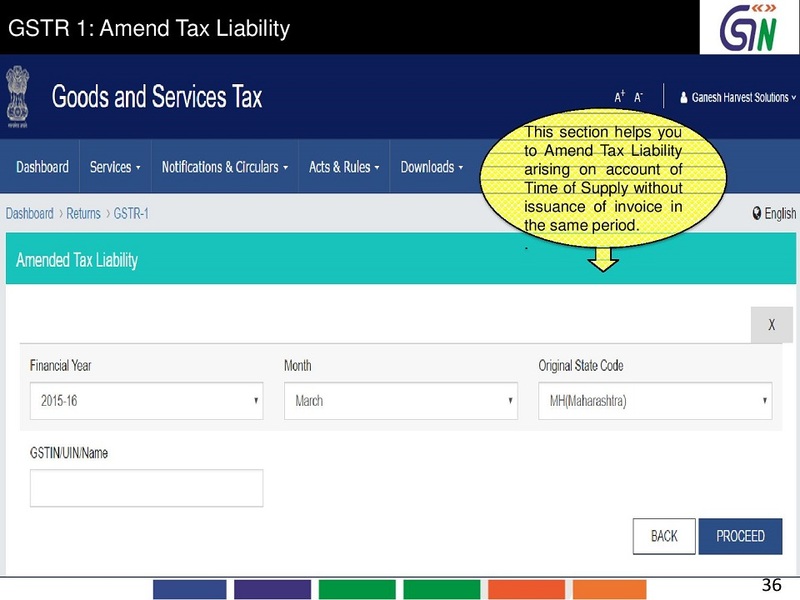 This section shows you the Summary of Amended Tax Liability arising on account of Time of Supply without issuance of invoice in the same period. 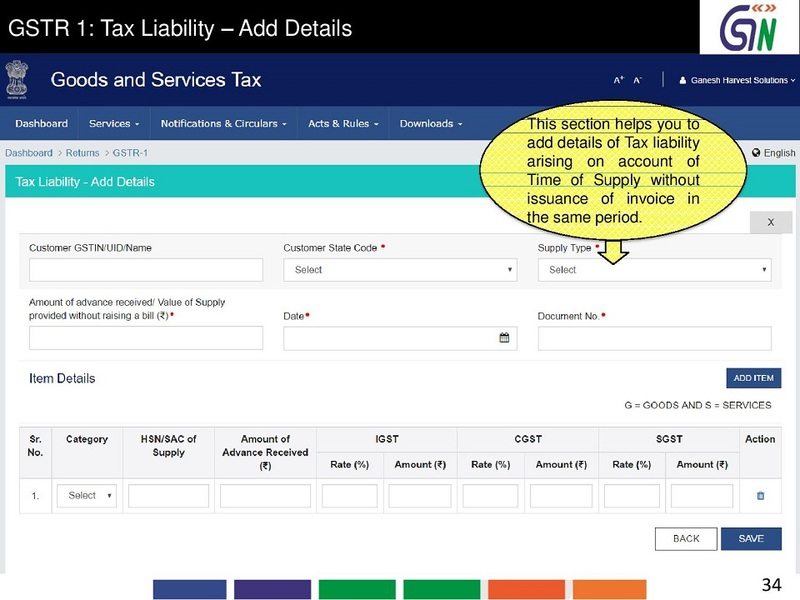 This section helps you to Amend Tax Liability arising on account of Time of Supply without issuance of invoice in the same period. 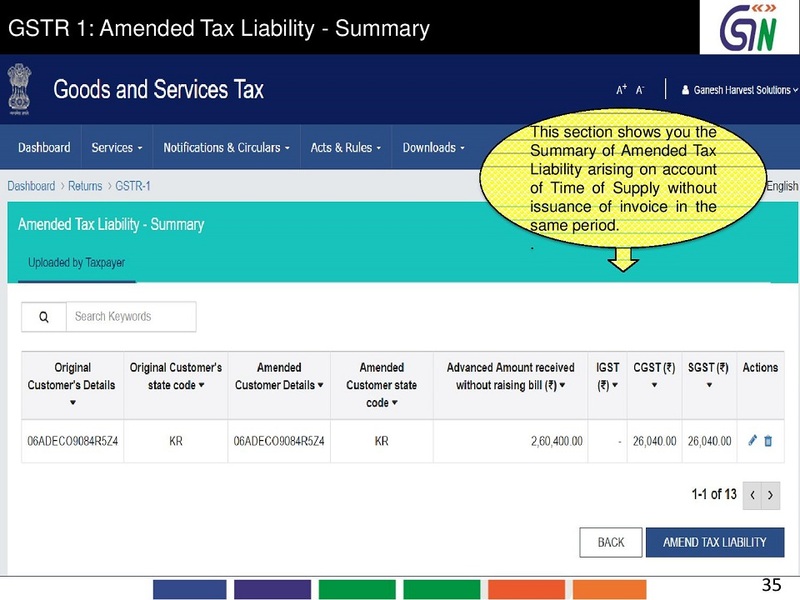 This sections hows you to Summary of Tax already paid (on advance receipt / on account of time of supply)on invoices issued in the current period. 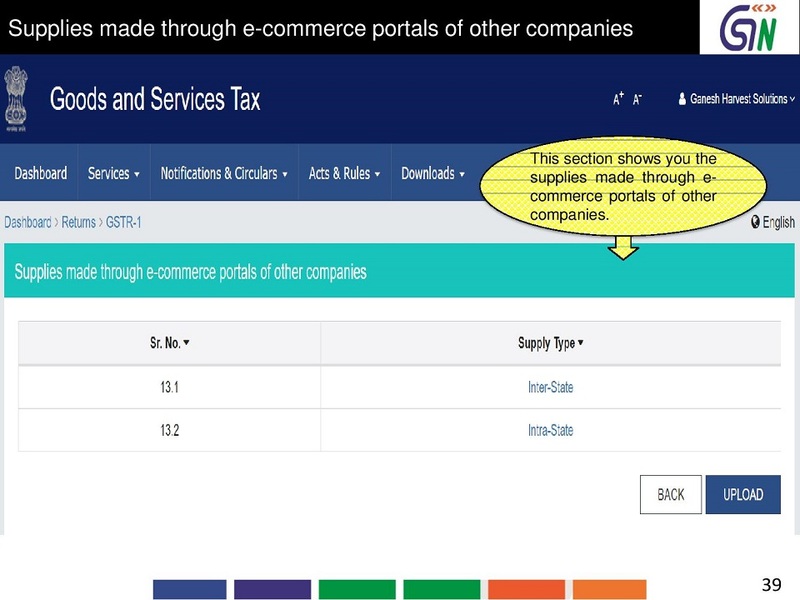 This sections hows you the supplies made through e-commerce portals of other companies. 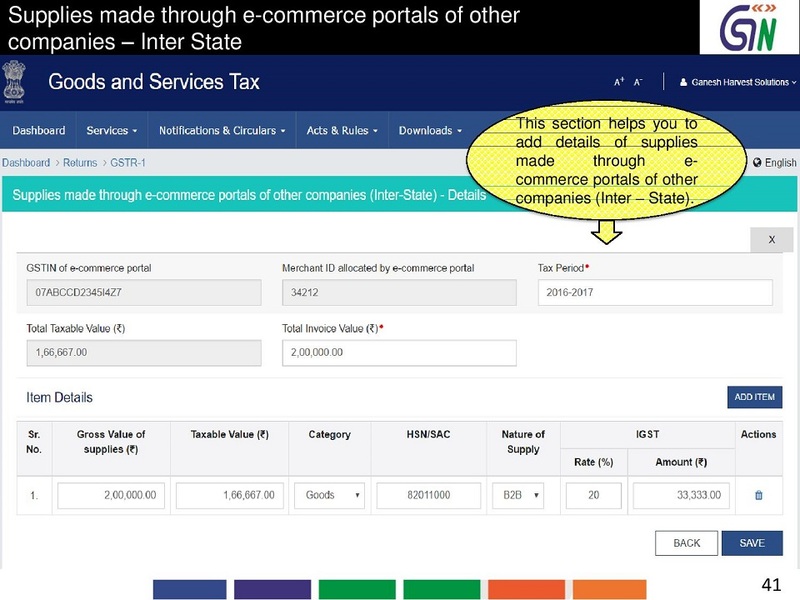 This section helps you to add details of supplies made through e-commerce portals of other companies (Inter-State). 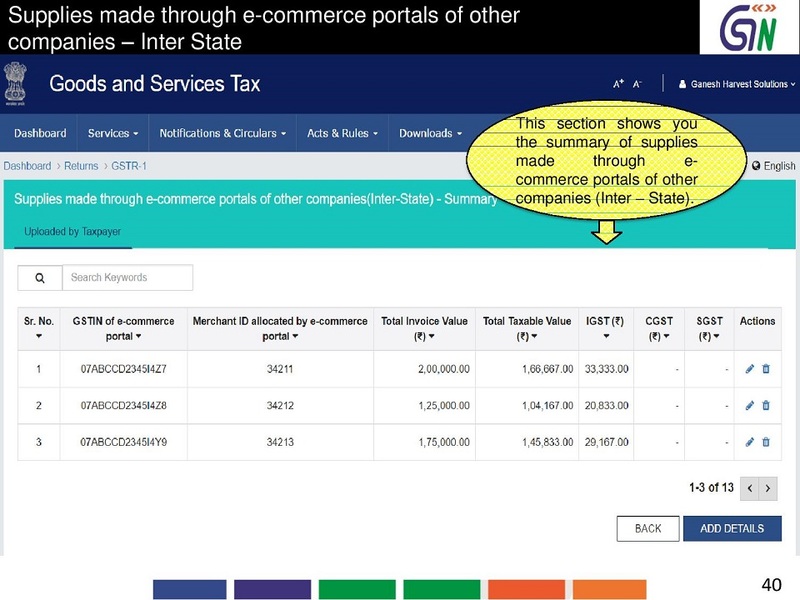 This section shows you the summary of supplies made through e -commerce portals of other companies (Intra-State). This section helps you to add details of supplies made through e-commerce portals of other companies(Intra-State). 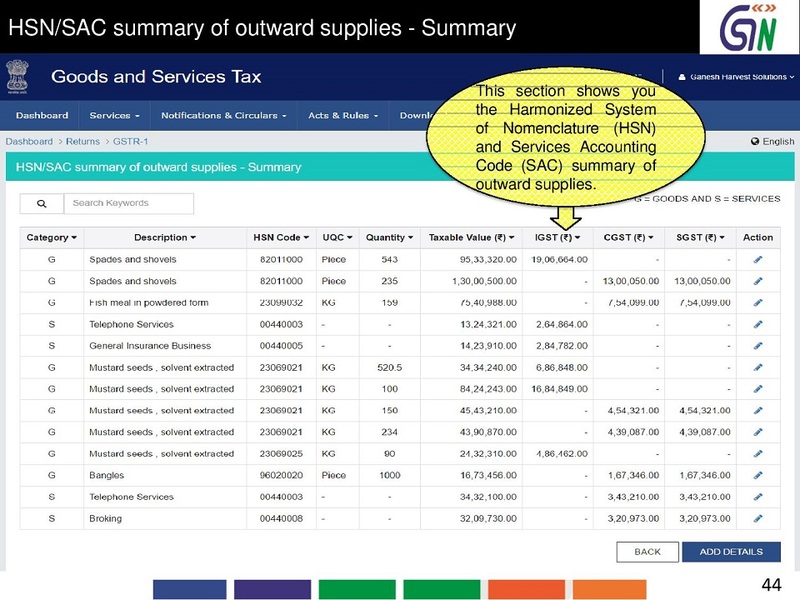 This sections hows you the Harmonized System of Nomenclature (HSN) and Services Accounting Code (SAC) summary of outward supplies. This section helps you to add the items under Harmonized System of Nomenclature(HSN) and Services Accounting Code (SAC) summary of outward supplies.